From theatres to skyscrapers, Edmonton is evolving into a world class metro right before our eyes! YOU'D never know that Alberta has been in an economic downturn for some time now, especially if you live and work here in Edmonton. It's hard to keep track of everything that is happening in our city, in terms of development or redevelopment. In every corner of the city - although especially in the central area - you'll notice new buildings, towers, bridges, and even a funicular(! ), whatever that is. Edmonton is booming with multi-million and even billion dollar projects everywhere we turn. And I don't just mean the obvious Ice District in the downtown core, nope! 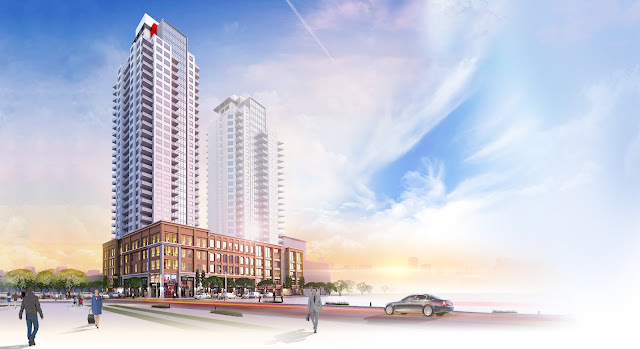 There are condo towers popping up all over the city, renos and expansions to current structures, or brand new facilities replacing old ones; not to mention the countless restaurants, shops, theatres, and cafes filling up real estate all over town. 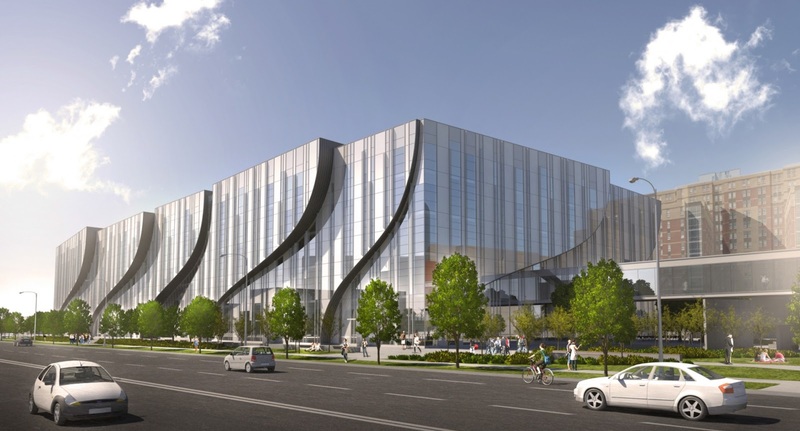 An ambitious $40 million expansion & upgrading project for the Telus World of Science was put into motion this past spring, and will see an additional 20,000 square feet added to the current 130,000-square foot, 32-year-old west-end facility (112 Avenue & 142 Street). 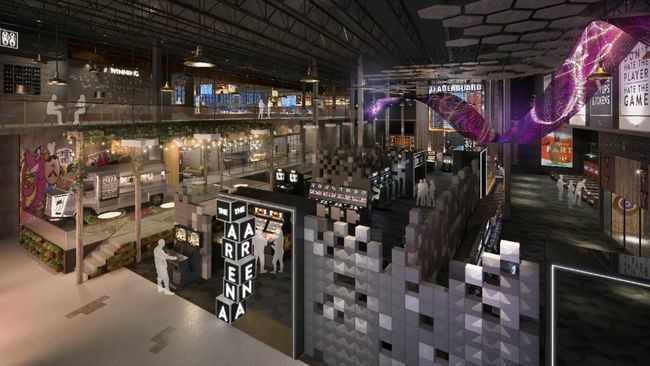 The project includes a renewed health-science gallery (The Body Fantastic), a brand new Canadian Arctic & polar region gallery, planetarium upgrades, a new gift shop & refreshed entrance, and a new lobby that will double in size. The reno is expected to be completed sometime in 2018. West Edmonton Mall's Scotiabank Theatre is one of the most popular spots for Edmontonians to go see the latest blockbusters. 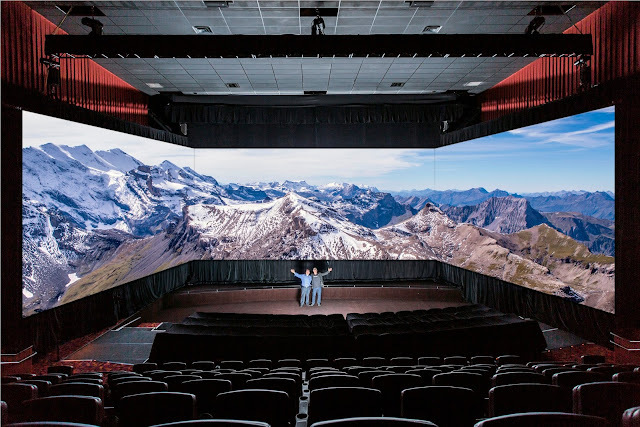 Well now it's about to become even more appealing for movie-goers, as Edmonton will become one of only three metros across the country (along with Toronto & Vancouver) to offer a 4D panoramic theatre experience. The Barco Escape theatre will feature three screens and state-of-the-art cinematic technology, premiering with the latest Star Trek feature on July 22. Actually, there will be several upcoming movies that will be filmed specifically with these sort of theatres in mind, including 6 Below and The Recall. Proposed for Bellamy Hill in between Edmonton's downtown and river valley, this unique 75-unit structure (from Edmonton's own Dub Architects) will offer three-storey homes clustered together and designed around a three-seasons balcony, and will include passive solar heating and operable screens to control overheating. Oh, and then there's that view! How many large metros get to build a whole new neighbourhood right in the middle of the city?! I can't think of one, but Edmonton is about to do just that. 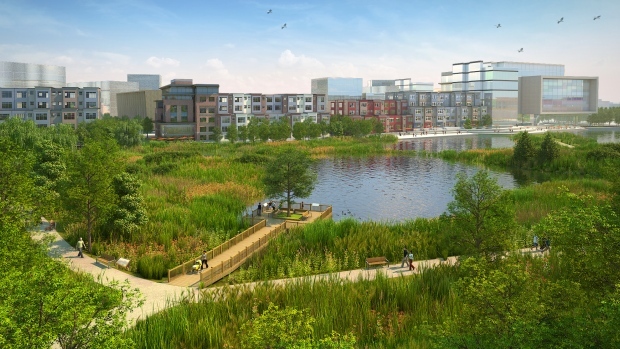 Although the Blatchford project is currently on hold, it will eventually become a environmentally-friendly, pedestrian-oriented, family-focused community just minutes from downtown, on land once belonging to the City Centre Airport (1927-2013). This 536-acre proposal will be one of the largest sustainable development projects in the entire world, potentially home to some 30,000 Edmontonians by the time it is complete many years from now. It is expected to offer housing for students, families, and urbanites, including affordable housing, and will include a "town centre" with office and retail space, a transit & LRT station, walking & cycling paths, community garden lots, a large central park, and two stormwater lakes. When the "new heart of NAIT" opens this fall, it will house approximately 5,000 full-time health, business, engineering technologies, and sustainable & environmental management programs students! The 51,600-square foot CAT building will be 60% larger than any other building that is part of the Northern Alberta Institute of Technology, and will include 45 labs and advanced simulation environments, 57 classrooms, a 135-seat lecture theatre, the Student Service Centre, studying and socializing space, universal washrooms, and a food court. 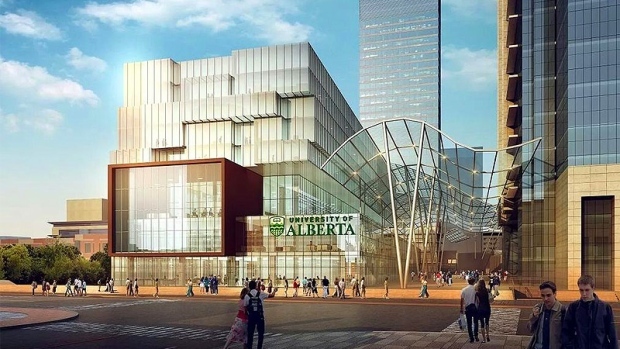 MacEwan University's Centre for Arts & Culture will offer 430,000 square feet of classroom, lab, exhibit, and performance space for the Faculty of Arts & Communications. This $180 million facility will offer all the programs currently available at the west-end campus of MacEwan, with state-of-the-art technology and the convenience of being located right across the street from the main downtown campus (104 Avenue & 110 Street). 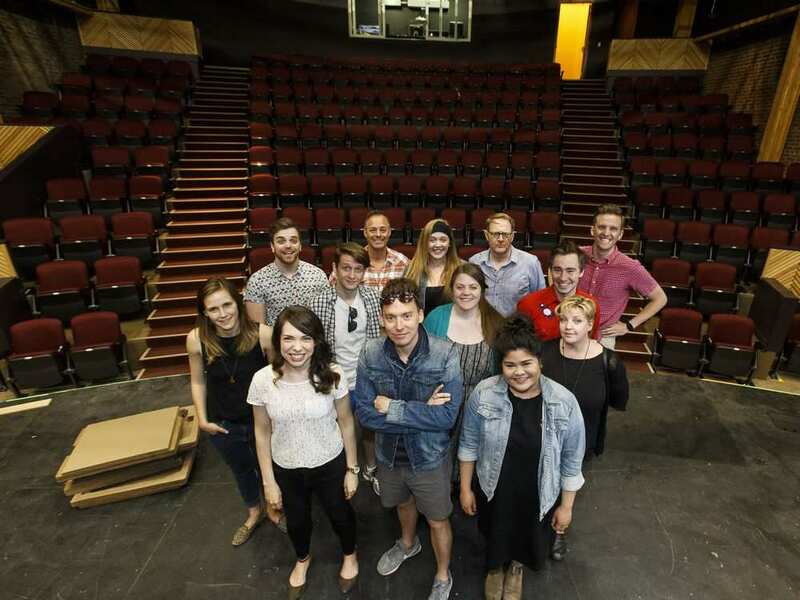 MacEwan has come a long way since its early days as a community college, substantiating Edmonton's ever-growing stance in the education sector. 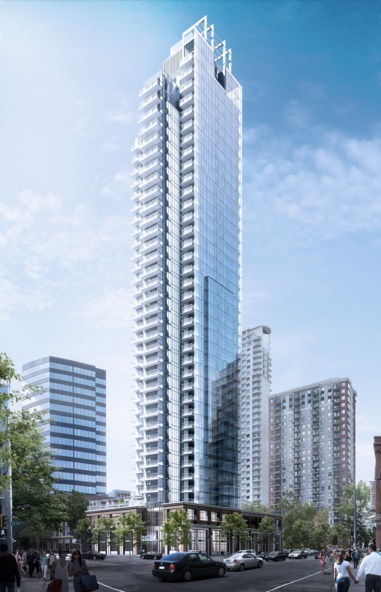 The Canadian National Institute for the Blind will erect a stunning 35-storey apartment building that would replace its current office building on Jasper Avenue & 120 Street, where their clients could call home. The bottom floor of the tower would be used for their new office space, and there will be design features very unique to anything else in town. In fact, the non-profit CNIB is in talks with blind architect Chris Downey to assist in the some of the features of the structure. City council needs to approve the zoning before anything can move forward. On the outskirts of downtown, in the Oliver community, is the 13-acre Brewery District, which is already partially open to locals. 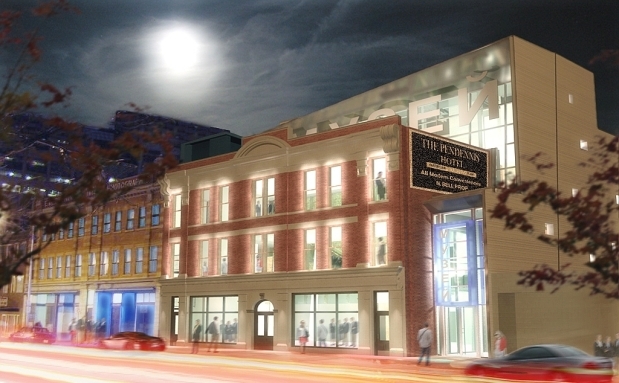 It has integrated the historic Molson Brewery that stood vacant and ignored for years...not anymore! The district is made up of beautiful brick structures that will house all sorts of commercial outlets, including a Starbucks, Mountain Equipment Co-op, Winners, Shoppers Drug Mart, Good Life Fitness, and the 40,000-square foot Loblaws City Market, the first of its kind in Edmonton. The grocery chain is actually now open, offering fresh organic and local options, a giant vertical cheese wall, and an irresistible patisserie. There's also 250,000 square feet of free, heated, and secure underground parking. Former race car driver and local businessman Jay Esterer purchased the Edmonton Queen riverboat last April, sort of on a whim, spending $553,000 to become its new captain. 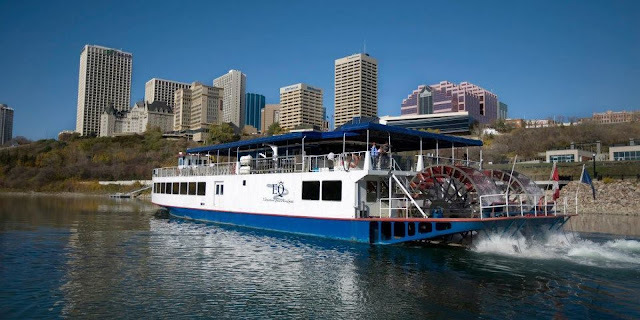 He has plans to restore and upgrade the 170-foot boat and turn it into one of the city's most unique dining and entertainment experiences, even if it means staying docked for most (or all) of the year. 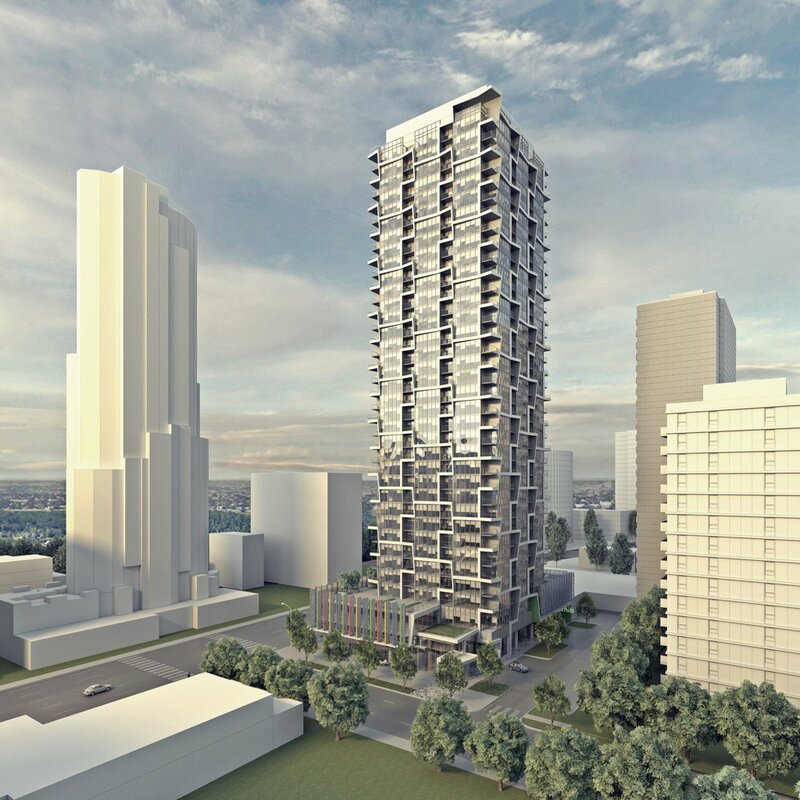 Despite complaints from Oliver neighbourhood residents, the City gave the green light for what will be Edmonton's tallest residential tower. The Emerald will stand 45 storeys along Jasper Avenue & 114 Street, with the first floor dedicated to retail space. It is being built by Regency Developments, the same folks behind the Avenue's 35-storey Pearl Tower. 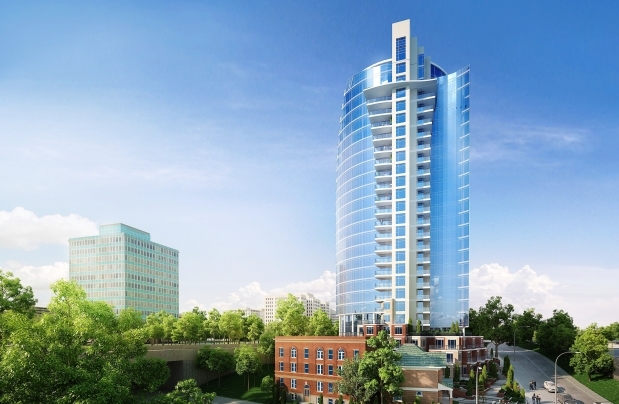 The Westrich Pacific Corporation is planning on turning the corner of 103 Street & 102 Avenue into the all-glass, energy efficient, 40-storey Encore Tower, which will include a rooftop lounge and pool, concierge service, and a three-storey grand lobby. It will be located just a couple of blocks from the upcoming Ice District. Canada's largest living history museum has been a local favourite since 1974, but it's been long overdue for an upgrade, wouldn't you say? The 158-acre attraction recently received $33 million in provincial funding to allow it to expand its 1920s Midway, the Hotel Selkirk, the Guest Services/ Admission area, and of course the Indigenous Peoples' Experience. In addition to the expansion, the Park will become a year-round attraction, which will create many new jobs as well. Fort Edmonton will remain closed for two years once construction begins sometime in late 2017 or early 2018. 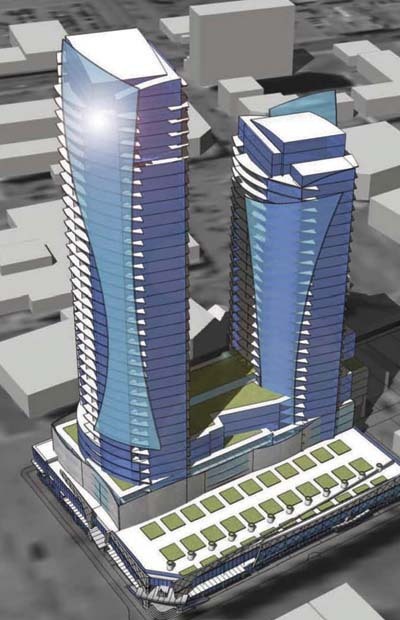 Located on the site of the former bus barns at 102 Avenue & 104 Street, the pair of Fox Towers will rise high into the sky along the 4th Street Promenade. The first tower has already been completed and sold out, stretching 28 storeys above ground (142 units), while the second tower will see 169 units within 33 storeys when it is completed. 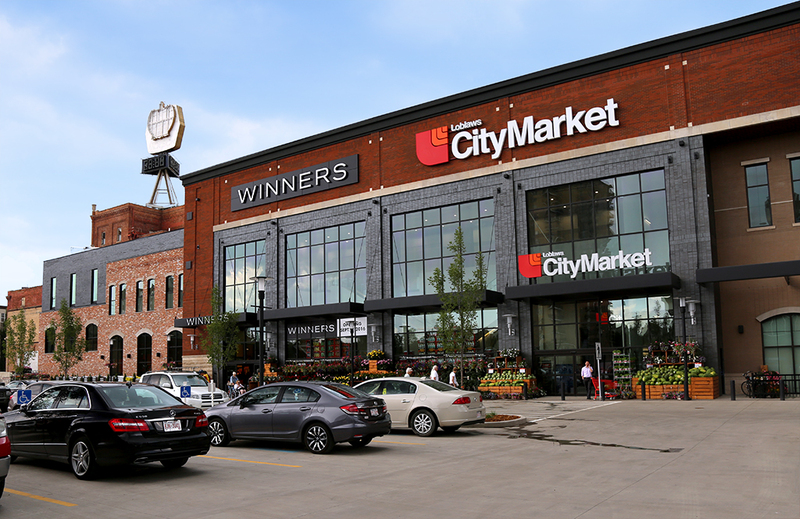 This "walker's Paradise" will also include a five-storey brick podium to reflect the historic nature of the neighbourhood, featuring retail shops, businesses, and restaurants. The Mechanized River Valley Access project is already in the works (since March) and will help make our stunning river valley more accessible to people of all ages and abilities. The $24 million funicular will be a sort of diagonal elevator connecting 100 Street (near Hotel MacDonald) to the river valley trail system near the Low Level Bridge. This innovative and barrier-free system is designed to include programmable spaces, as well as spots for social engagement, active play, and relaxation. Construction is expected to be complete by the fall of 2017. 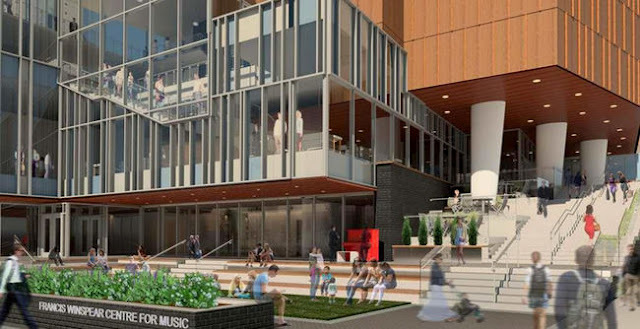 Behind City Hall and adjacent to the new Royal Alberta Museum (along 103A Avenue) is a large area planned for the Galleria, an ambitious project that will essentially offer affordable, accessible, and suitable performance space for students, artists, and performance companies. It will be made up of four separate theatres, income-producing real estate that will subsidize the costs of operations and maintenance with retail, commercial, and residential components. It will also include an LRT pedway. There's no denying that Ice District has been a catalyst for development, redevelopment, and revitalization in Edmonton's downtown core. 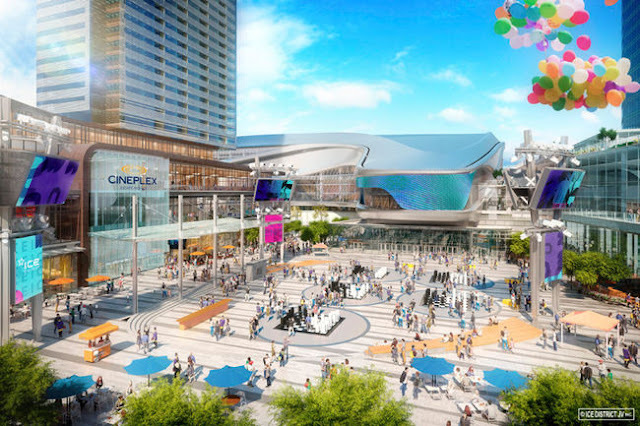 What will soon be Canada's largest mixed-use sports and entertainment district has ignited a frenzy of progress in an area that desperately needed it. 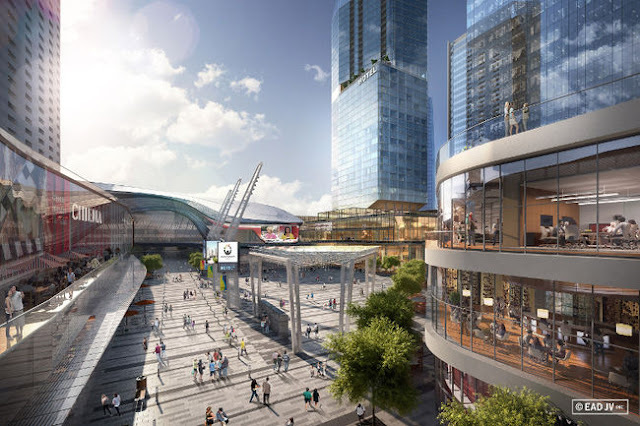 Ice District in itself is pouring some $2.5 billion into a 25-acre region that will be anchored by the 18,500-seat Rogers Place arena, expected to be one of the finest arenas around the globe. But there is so much more to Ice District than just the arena, such as the 356-room JW Marriott Hotel, the Grand Villa Edmonton Casino, the 27-storey Edmonton Tower, the Cineplex UltraAVX & VIP Cinemas, the Winter Gardens, the MacEwan LRT & bus station, the community arena, sophisticated residential and office space, and the 60-storey Stantec Tower, which will be the tallest building in Canada outside of Toronto. 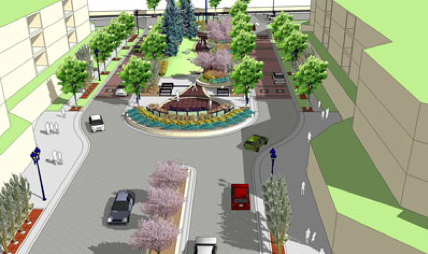 The vibrant public plaza, just outside of Rogers Place, will become one of the city's main meeting places, surrounding by cafes, restaurants, shops, a grocery store, and a large fitness facility. Although Rogers Place is expected to be completed by September 2016, the entire district will come together over the next year or so. Have you ever noticed all those surface parking lots behind the Boston Pizza on Jasper Avenue and 106 Street?! Well, a developer will finally be replacing one of those lots with the upscale 36-storey, 260-unit Jasper House Tower, which will include an outdoor pool for its tenants. 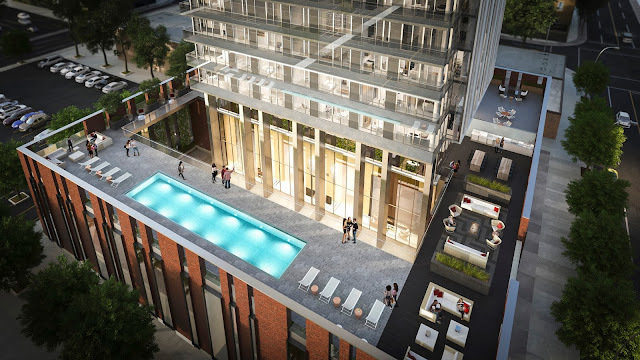 Toronto's "Condo King" Brad Lamb (from HGTV's Big City Broker) is the man behind this luxurious development. It may not be the most exciting upcoming project in Edmonton, but it's still pretty important nonetheless. 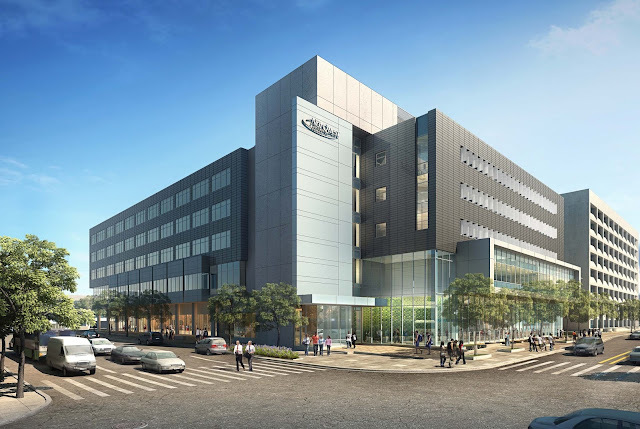 Named after Edmonton's first-ever female bus driver, this $196 million, 500,000-square foot facility will help spur further development in the Fort Road area of north Edmonton (129 Avenue). The size of about 10 football fields, the garage will have the capacity to fit 300 buses and some 700 drivers and other employees. In addition to these impressive numbers, the garage will also include Edmonton's richest-ever public art commission! The $1 million "53º20 — 40’N" art installation was designed by Berlin artist Thorsten Goldberg. It is expected to be completed by 2017. 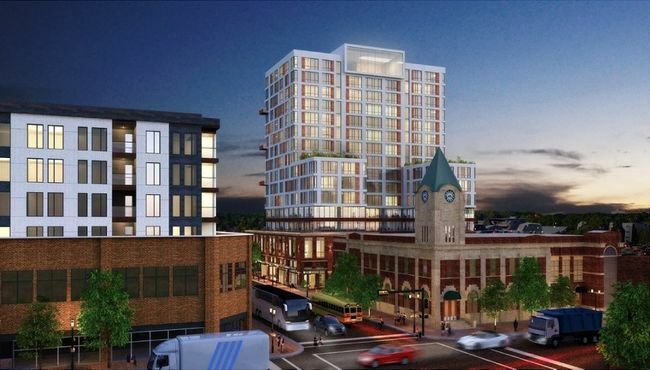 Edmonton's first new Financial District tower in a quarter century, the stunning 29-storey Kelly-Ramsey Tower incorporates the four-storey facades of two historic buildings from the original property, which will likely include retail shops and eateries. 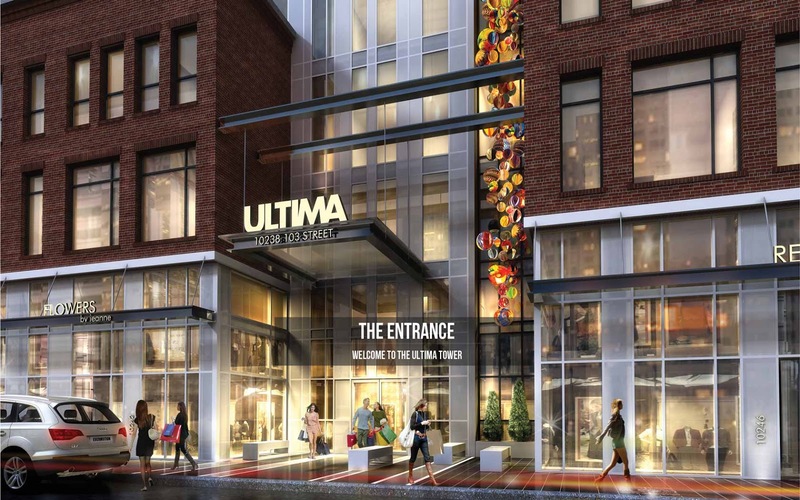 The $250 million revitalization (at 101 Street & 101 Avenue) is located right in the heart of downtown, surrounded by countless boutiques, restaurants, cafes, and the City Centre Mall. Developed by ProCura, The Mayfair is a 10-storey, 237-unit residential and commercial project right on the corner of 109 Street & Jasper Avenue. 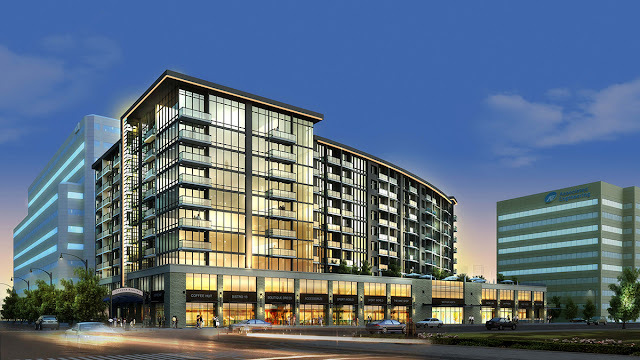 When construction is completed later this year, it will be Edmonton's first residential building to offer a cogeneration energy system, which repurposes wasted heat into electricity. It is one of many examples of Edmonton's positive and progressive attitude towards an environmentally-friendly future. 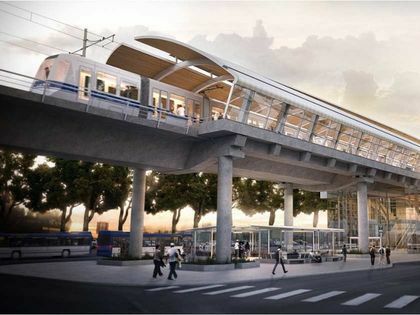 The Metro Line has already caused countless headaches for both the City and its residents when construction of the first phase was completed, connecting NAIT with the Royal Alexandra Hospital. However, this will hopefully just be temporary. The remainder of the Metro Line will see the LRT go from NAIT all the way to the outskirts of town, near St. Albert in the northwest, with stops at Blatchford, Castle Downs, Griesbach, Campbell Road, and more. There is also a proposal to have the line stretch right into the City of St. Albert. Old Strathcona is one of Edmonton's most precious and beloved neighbourhoods, although some would argue that it is lacking foot traffic from area residents. The controversial 16-storey Mezzo Tower will replace an old church and empty lot just south of the buzzing Whyte Avenue (81 Avenue & 105 Street), offering condos, affordable housing, and commercial space, all the while preserving the character of the area with its Edwardian-style facade. The controversy stems from the building's height, 10 storeys above the previous maximum restrictions, yet four storeys shorter than the original proposal. The City fortunately made an exception! Edmonton has always been famous for its malls, but its been awhile since the city has seen a brand new one. Quebec-based Ivanhoe Cambridge and U.S.-based Simon Property Group are developing a 428,000-square foot outlet mall at the Edmonton International Airport, which is technically located just outside of city limits in Leduc. 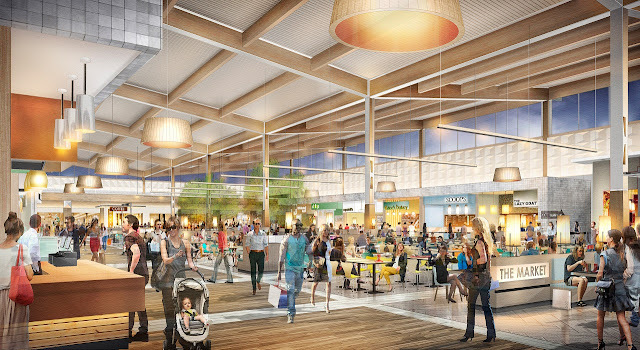 When the mall opens in the fall of 2017, there will be about 100 stores and services, including some that are brand new to Alberta. 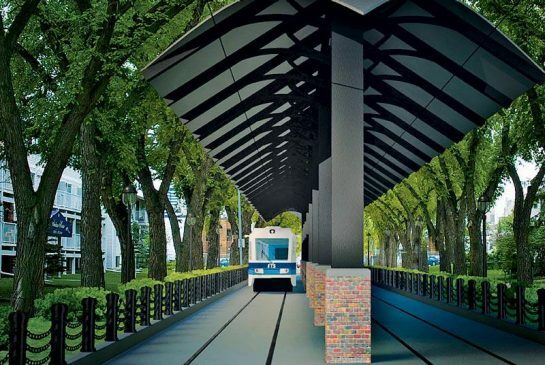 Unbeknown to perhaps many Edmontonians, the Quarters is a vibrant, pedestrian-focused district under construction on the eastern edge of downtown, extending from 92 to 97 Street and from 103A Avenue to the river valley. This 100-acre site has the potential for upwards of 2,400 residents, as well as numerous opportunities for restaurants, cafes, boutiques, and other businesses, which will share space with affordable housing units, family & childcare services, park & cultural space, and a community garden. 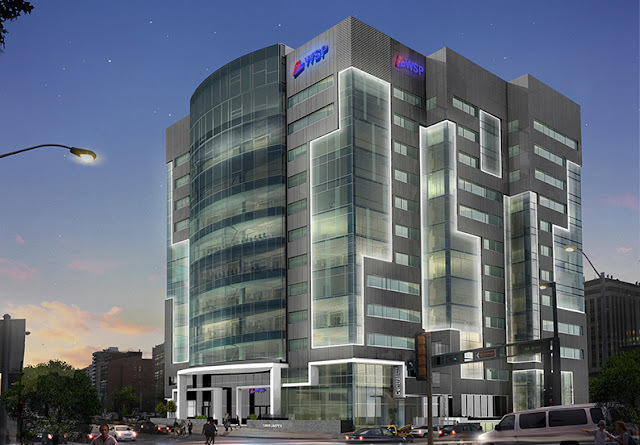 One of the Quarters' commencing tenants is the 12-storey Hyatt Place Hotel, the downtown's first hotel since 1978! There are also talks of a large patio that would overlook the river valley, just on the other side of Jasper Avenue, across from the Hyatt. The ultimate social playground for kids and adults will bring thousands more to South Edmonton Common, as the $10 million Rec Room will offer recreational activities, performance space, a race car driving simulator, giant high-definition screens, a 90-square meter virtual reality wall, bowling alleys, billiards, axe throwing, table tennis, foosball, an outdoor bocce court, an upstairs patio, plenty of food & drinks, and some 140 arcade & redemption games! The 5,600-square foot facility will also boast the country's largest wood-fired grill, and will open sometime this summer. 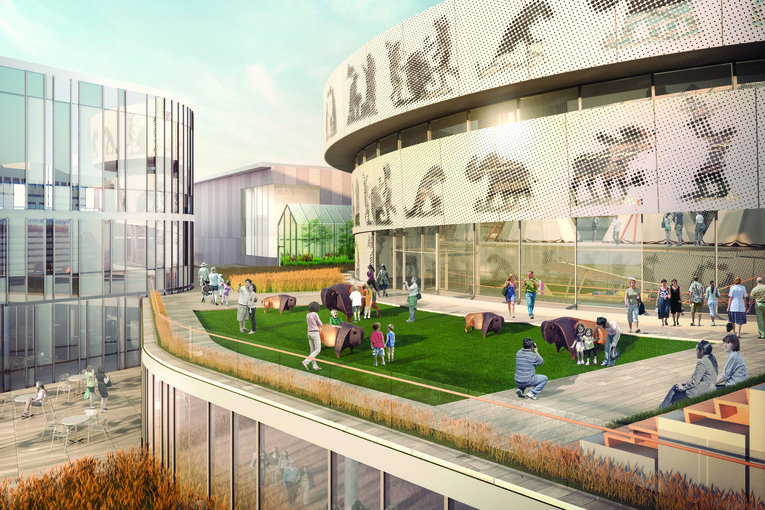 Once the new Royal Alberta Museum is completed in late 2017 or early 2018, it will be Western Canada's largest museum (419,000 square feet), twice the size of the original Glenora facility. 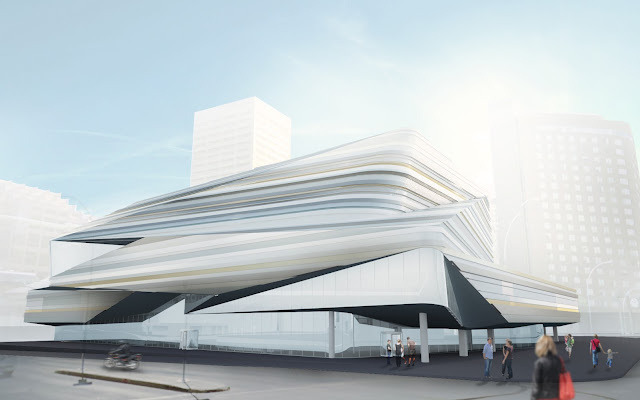 Unlike before, the $375.5 million museum will be in a prime location, downtown next to Churchill Square, Chinatown, and Ice District (97-99 Street & 104 Avenue). With some 82,000 square feet of exhibition space, the new museum will dedicate zones to Natural History, Human History, Children's Gallery, Bug Room, and the Feature Gallery, as well as educational and public programming all year long. As for what will happen to the old building, that's still up in the air, although the City has asked the public for their input. Set to open its doors in 2017, the $192 million Singhmar Centre is a very necessary expansion of the Norquest College in downtown Edmonton, just a couple of blocks from MacEwan University. The four-storey, 242,000-square foot extension will house a central atrium, lab, food services, library, daycare, and student activity space, and will be connected to the original South Learning Centre (which is going through renovations as well) at 103 Avenue & 107 Street. With about a million visits a year, the nearly 50-year-old Stanley A. Milner Library is Edmonton's busiest branch. However, it is beginning to show its age, which is why the City is putting over $62 million into revitalizing the unimaginative structure that is situated just off of Sir Winston Churchill Square. The new facility will have a children's library three times the size of its current one, as well as a larger Makerspace, an additional 4,000 square feet for studying and reading, 2,500 square feet of community space, a high-tech theatre, and a multi-storey interactive simulation wall. 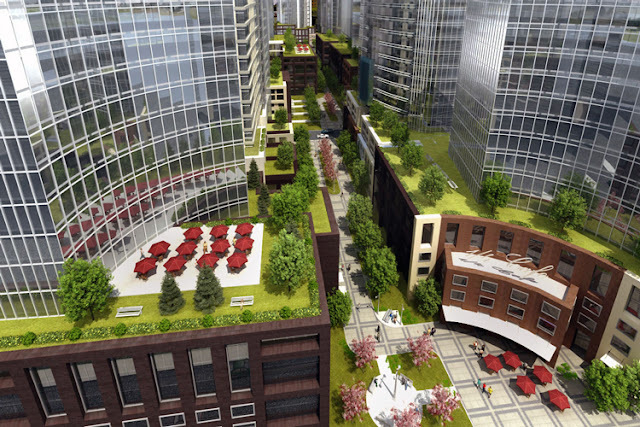 The outer design is also beyond words, unlike anything our city has seen so far. Construction is expected to commence in 2017 and last for about two years. Meanwhile, the library will move to its temporary home at Enterprise Square (10230 Jasper Avenue) until 2020. It has been years in the planning, but Fort Road's Station Pointe Village development is well underway as we speak! This subdivision (near the Belvedere Transit Station) is a unique community designed entirely for families, seniors, and first-time home purchasers, consisting of multiple buildings with their own individual themes. They will be split into three different dwellings, "Landing," "Manor," and the 16-storey "Garden" seniors' complex. 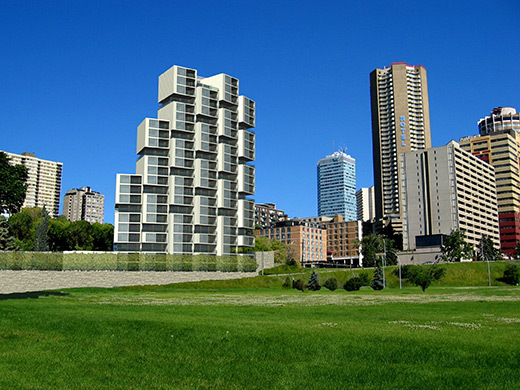 Overlooking the river valley and the Alberta Legislature Grounds will be the 27-storey, 143-unit Symphony Tower (106 Street & 97 Avenue), which will include six unique luxury town homes. It is expected to be completed sometime in 2017. 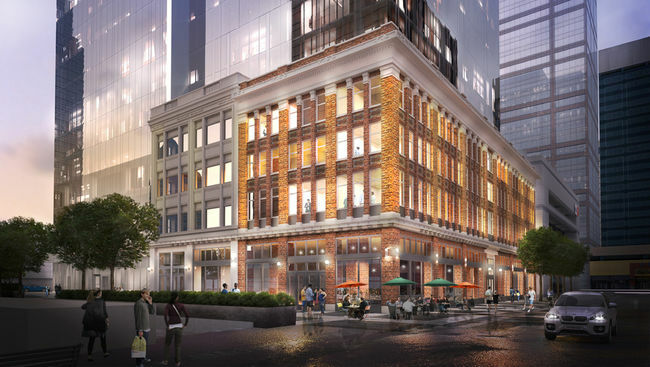 Jasper Avenue & 96 Street will soon be home to the UCAMA, which will take up residence in the historic Lodge Hotel & Brighton Block building. This $20 million project will allow UCAMA 26,000 square feet of exhibition galleries, an archive & library, and resource & programming space, as well as traveling exhibits. 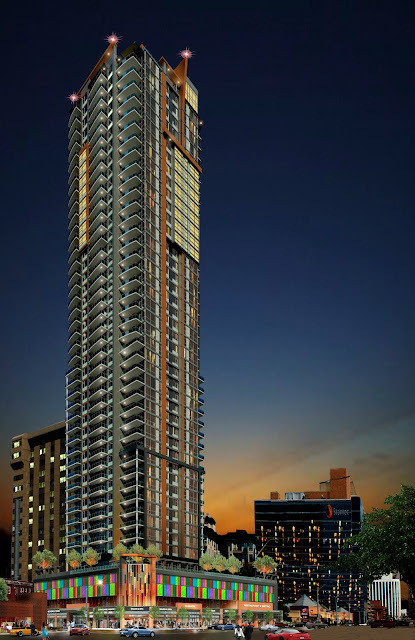 Located right next to the vibrant Ice District and right across the street from City Centre Mall (at 102 Avenue & 103 Street), this 33-storey condominium tower (from Westrich Pacific Corp.) will be the perfect spot for young professionals and couples looking for an ideal first home. In addition to its 9th floor rooftop patio and its scenic views, the Ultima is within walking distance of many of Edmonton's most acclaimed restaurants and cafes. Connecting our city like never before, the Valley Line will eventually stretch 27 kms from Mill Woods in the south to Lewis Farms in the west. There will be nearly 30 stops when all is said and done, including stations at Grey Nuns Hospital, Bonnie Doon, the Muttart Conservatory, the Quarters district, Churchill Square, 124th Street, Meadowlark, and West Edmonton Mall. Construction of Phase One of the $1.8 billion venture begins next year and will go until 2020, and includes the Tawatinâ Bridge over the North Saskatchewan. This is the only project on this list that has actually wrapped up construction, reopening just last month. The brand new $7.5 million, 205-seat theatre in the heart of Old Strathcona (103 Street & 83 Avenue) retained the old brick walls and fire tower of the former structure, and will be home to eight of Edmonton's finest theatre groups, including Die-Nasty, Shadow Theatre, and Teatro La Quindicina. 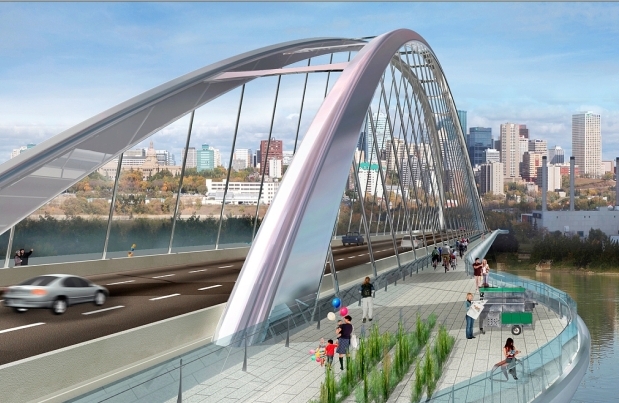 Our historic High Level Bridge will have some competition when it comes to the city's most stunning bridges, when the new 230-metre long/ 40-metre high Walterdale Bridge opens to traffic later this year. The bridge can be seen from miles away, and is quite the site when you're up close, spanning the North Saskatchewan along River Valley Road/ Rossdale Road/ 105 Street. 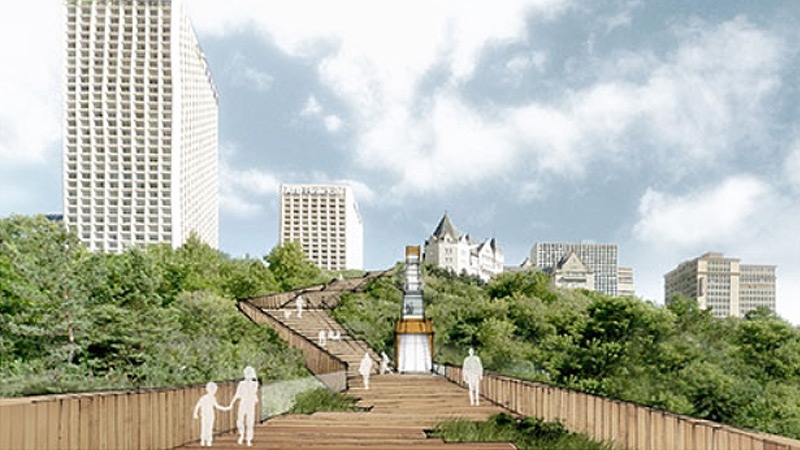 The $155 million structure will feature three northbound traffic lanes and enhanced pedestrian & cyclist crossings, replacing the century-old original Walterdale. Construction commenced on Canada Day of 2013. 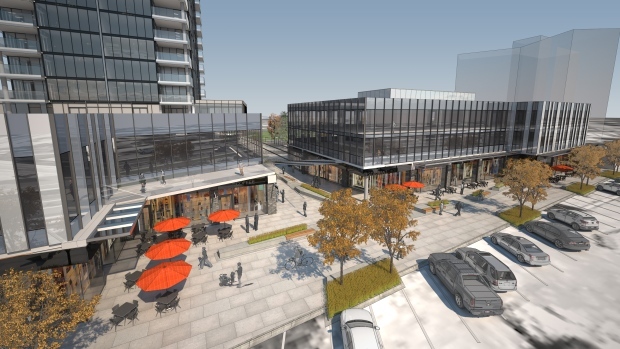 Following a series of delays for the former Glenora Skyline, the City has given the go-ahead for InHouse to redevelop this Glenora intersection (142 Street & Stony Plain Road) into a mixed-use residential, retail, and office space project known as West Block. Construction of this urban square will start in October and will include a 16-storey glass tower and a three-storey commercial building with shops, cafes, and restaurants. Nearly 20 years after the Winspear Centre for Music was established just off of Sir Winston Churchill Square in downtown Edmonton, a 40,000-square foot cultural expansion will cover up the surface parking lot just behind the original building. That dark concrete lot will be transformed into a mixed-use facility with immersive art experiences, a childcare centre, studio and programming space, and a multi-use acoustic hall. ProCura will wrap up renovations to the 12-storey WSP Place building right on the bustling corner of 109th Street & Jasper Avenue this December. 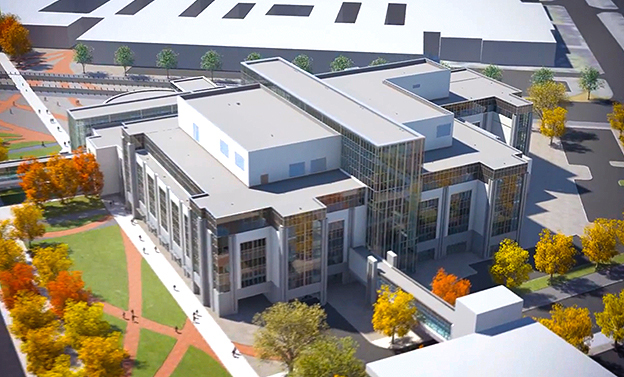 Major developments for the former Associated Engineering Building will include recladding the structure's concrete edifice with aluminum and a triple-pane windown wall system, tenant space improvements, new heating & ventilation, and green additions such as a natural-gas fired cogeneration plant! The first two floors of these 28-storey and 38-storey (296 units total) "twin" towers will be dedicated to retail opportunities in an area that could use the boost. Developed by the Yorkton Group, these condos are at 97 Street & 105 Avenue, just off of Chinatown, which will likely (& hopefully) be getting a much-needed makeover itself in the coming years.